Convergence Insufficiency and Convergence Excess can lead to a number of frustrating symptoms that interfere with the ability to read, focus, and work comfortably at near tasks. Similar symptoms result from both of these diagnoses and include: words that appear to move on the page, blurring of words, skipping words or lines, headaches, difficulty to sustaining reading for long periods of time, and double vision. 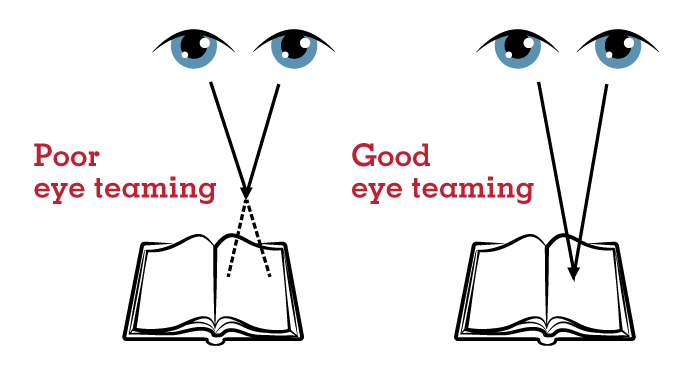 With good eye teaming, our eyes should align and meet in space when looking at an object. With this diagnosis, the brain perceives an object at near to be farther away than it is, which results in the need for extra effort to be used as the eyes and brain must work harder in order to point accurately at the object. Therefore, the eyes have a tendency to turn slightly outward when viewing close objects due to this problem with localization. With this diagnosis, the brain perceives an object at near to be closer than it is, which results in the need for extra effort to be used as the eyes and brain must work harder in order to point accurately at the object. Therefore, the eyes have a tendency to turn slightly inward when viewing close objects due to this problem with localization. If you would like the schedule an evaluation, contact us.